The excitement at this end, if that's the right word for it, is all about my son Mike, who was on his bike when a car decided to occupy the same space he was in, and who now has a cleanly broken leg and a destroyed bike (and semi-destroyed bike helmet, and glad I am it was his helmet and not his head). His mum has gone to San Francisco to help him and bring him back. Seeing that he's going to have to work from home, we figured it would be easier for that home to be here, rather than an apartment up many stairs. He'll arrive on Monday, and I've made up a bed for him on the ground floor. The only weird thing about Blueberry Girl is that it's really not weird. One of the best things about supporting the Comic Book Legal Defense Fund and having this blog and the Twitter account is that occasionally things spontaneously pop into existence. (The connection with Black Phoenix Alchemy is one of them.) Back in January a blog entry someone sent me about a coffee shop in Indonesia selling Author Coffee suddenly turned into several different versions of Neil Gaiman novelty coffee. Put the dark chocolate in the bottom of a glass, add the almond syrup and coffee, then stir. 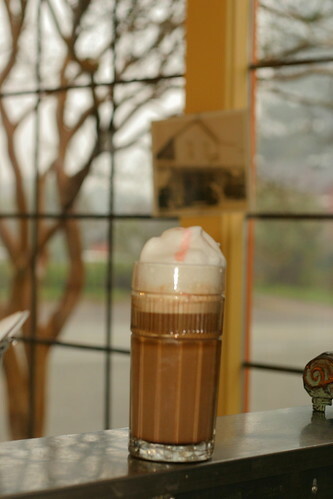 Cover with steamed milk and foam, then drizzle with dark cherry syrup. And it looks like this. You can buy it at ZubZub, in Boonville, California. I was wondering if I might get a book signed by you. Yes, I am aware that I should send it to you with all postage paid, but I have a problem - I don't actually have the book yet. I am looking into buying it off the site and wondering if it might not be too much trouble to pay the extra, or however it might work out, and get it a little sooner than it would take to get it and send it there and back. I was hoping to get it back in time for a present to someone. You know, I need to update the FAQs on getting stuff signed. The best shot at buying something signed by me is still going to Greg Ketter at Dreamhaven Books. Greg owns and runs the neilgaiman.net website. Do not send him books in the hopes he will get them signed and returned. The volume of books coming in was such that he had to stop doing that, especially since he downsized DreamHaven to a one-man operation. The books you send just get returned. If you buy a book from Greg, he can get it signed for you, as long as you understand that he has no control over when I will stop by to sign, and as each time I go there to sign it takes longer and there are more books, and because I am on the road a lot, it can often take several months for me to find an afternoon to get back to DreamHaven and just sign books for an afternoon. Greg cannot guarantee that I will get books signed and personalised in time for birthdays and suchlike. He just can't. I do not live in the DreamHaven basement, and time is always at a premium. Sorry, but we don't take requests for doodles or drawings. They either happen or they don't, depending Neil's schedule and whim. If you don't need personalizations, and all the items you are ordering say 'Signed Copies in Stock' or 'Signed Edition', they will ship right away just like unsigned items. For items that need to be signed or personalized, expect a delay of 2-3 months, depending on Neil's schedule. We don't know when Neil will be stopping by. Really. We usually find out less than 24 hours before it actually happens. So please be patient. You can check the news page to see when Neil last stopped by, and approximately when your order was shipped. I have just got my first book published but I do not have an agent and I want to do a book tour. Do you have any idea how I could go about this? Do I need an agent to do a book tour? 2) then try to get people to show up. Which is no fun. Almost as little fun as staring out at an empty space for an hour, occasionally telling people that you do not work there and you cannot direct them to the toilets. I'm not saying don't do a tour. I am saying that you had better know why you're doing it, and have people who would very much like you to come and make an appearance in their shops, or who would like a signed copy of your book, before you go. Do you ever think you'll try writing a comic series again? Rather then just writing the occasional issue of something here or there. Just wondering because I really loved Sandman and would like to see what you could do with another series, given the time. I very much doubt it. Writing the 75 issues of Sandman (and the follow-ups) took the better part of a decade, and I'd rather take a decade to do something I own and control and that feels like it's mine. And that's so much easier to do with prose than it is with comics. how consciously do you think Thief of Always influenced you in writing Coraline? (I know how much of the creative process is a subconscious whirlwind that takes in everything you experience and then surfaces whatever amalgamation of them it decides to at the unsuspecting conscious self from time to time, so the question is impossible to answer precisely, but still, I'd be delighted to hear your own opinion, subjective as it can be. Yours truly (who made sure to read Coraline to his kids a week earlier than letting them see it in the movie theatre in order for them to first see it in their own imagination). About a decade later, some years after Coraline had been published, I was sent a copy of The Thief of Always and a Bernard Rose film script of the book, and asked if I wanted to work on a film adaptation, and I read and enjoyed them both, and thought that really, the book wasn't anywhere near as Coraline-y as I had feared, but thought the Bernard Rose script was really good and there wasn't anything I could add to it, so I passed. well alone those of the urban castes your you know: Gothic, darks, gloomers, emos, blablablablba. There really is a magic that translation websites add to our lives, isn't there? I don't really know what you wanted, but if I had I doubt I would have enjoyed it anywhere near as much. Hear they're doing Addams Family on Broadway. Based more on Chuck's stuff than tv/movies. Do you opine? My friend Julian Crouch, who designed and co-directed the Improbable/National Theatre of Scotland The Wolves In The Walls, is working on it. Honestly, anything that casts Bebe Neuwirth as Morticia is all right in my book. I hope it's good, and I'm looking forward to seeing it. I can't think of anything that doesn't sound facetious or silly. Mostly you should consider whether you've actually got a story to tell, I suspect. Beyond that, just write the stories. You're seventeen. Write some stories. Start them somewhere, finish them somewhere. Give them to friends to read over. Write some more. Structuring a plot is something to worry about once you feel comfortable writing and finishing things and getting to the end; and it's often something that you do in the second draft anyway, or the fifth, where you reread what you've written and realise that perhaps it will be more effective if you start it at the end or in the middle, or from the point of view of the invisible cow. Just write your stories, as best you can. Neil, I just wanted to let you know that not only does my 4-year-old love "Blueberry Girl," but all on her own she decided that she wanted me to read it aloud to her -- while she danced. The cadences and beautiful illustrations have inspired her that much. Best letter of the day. Thank you back. I suspect that you aren't reading the blog, and are waiting for me to reply. But just in case you are reading this, and while I won't do your homework, you should find most of what you need in http://www.neilgaiman.com/p/About_Neil or http://www.mousecircus.com/MeetNeilGaiman.aspx. What will limit be on the number of items that can be signed at Luminato in Toronto and WorldCon in Montreal? Also I love all of your work, you are awesome. I don't know. It'll depend on the number of people who need things signed, and how much time there is to sign them. I can hazard now that it won't be more than three. My wife just bought tickets for the Coraline musical as well as a trip to NYC for my birthday (June 11) and I am thrilled. Two questions.. 1. as you are a Sushi connoisseur, any tips for great but affordable (in other words, not NOBU) NYC sushi? 2. OK if I send my Playbill to Dreamhaven to be autographed? Thanks. I love the various Nobu restaurants I've been to, but am never mad keen on their sushi. (The miso cod, on the other hand...) My favourite place to eat Sushi at in NY is still Sushi Sasabune. (Here's info on it.) Not cheap, but not crazy expensive, and memorable. And no, I'm afraid not. Best bet is to find me at a signing of some kind. Is the information on this link (about you) true? Or is the internet spreading rumors? Apologies for the nosiness - it just seems silly for people to spread rumors like this. Oh, there are creepier people spreading worse rumours. And at least this one is true (and you'll find Mary described as my ex-wife in most of the recent interviews). It's very odd being the subject of Internet Gossip. I mean, it's not what I thought I was signing up for when I started writing stories (and definitely not what Mary thought she was signing up for). Mostly I try and keep this stuff way off the blog, partly because I figure that the moment you do start talking about it, you lose any right to try and say "No, that's actually part of my private life, and is honestly none of your business," about anything, and partly because Mary is much more private than I am about all of this, and opted out of the blog many years ago, of her own volition, like the single Osborne sibling who elected not to be in the show. And besides, anyone whose business it is to know, knows. But at the point where it's turning up on Wiki-Answers... (shakes head). So let's see: for the record, we separated well over five years ago, did the paperwork on the divorce over a year ago, remain close and supportive, love being parents together and enjoy being friends (and, like in some early seventies sit-com, next door neighbours) more than we did being a married couple. She's terrific -- and is, as I said at the top of this, currently off looking after and bringing home a broken-legged son. So, you clearly have novels in you. But do you have something longer in you? I've recently become a fan of sorts of heptalogies (seven book works). Harry Potter is the most obvious example but the two I've recently read that struck me as pure masterpieces are King's Dark Tower series and Weiss and Hickman's Death Gate Cycle. I have a sinking suspicion that the best work from you will come after wrestling with stories and themes that might only fit in a longer work. Something like the ten volume (or twelve, or fifteen volume, depending on which spin-off books you count), 2,500-plus-page-vastness of Sandman, you mean? No, no real plans ever to do it again. But you never know: if I wind up starting a story that I realise demands that kind of length, I'll write it at that length. Certainly, in the decade since I finished Sandman I've really enjoyed not writing multi-volume epics.